Burnout Paradise Remastered Video Game for Xbox One. Released 2018 Rated E 10+ for Everyone 10 years old and up. - Relive the high-octane stunts and wanton destruction of one of the greatest arcade-driving games ever. - Burn rubber and shred metal across the open roads of Paradise City while discovering jumps, stunts, and shortcuts. Wreck your friends online or join forces to demolish hundreds of online challenges. 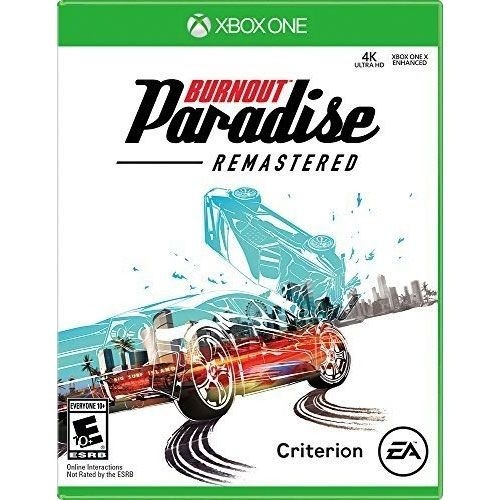 - This remaster includes the 8 main DLC packs from the Year of Paradise, including the Big Surf Island update, meticulously recreated and ready to wreck!